Thirty years ago this fall, Toyota embarked on a new journey by launching the Lexus luxury division. The brand has come a long way from the first LS and ES sedans. Today, Lexus offers something for everyone, from the popular RX 350, to the flagship LC 500 sports coupe. 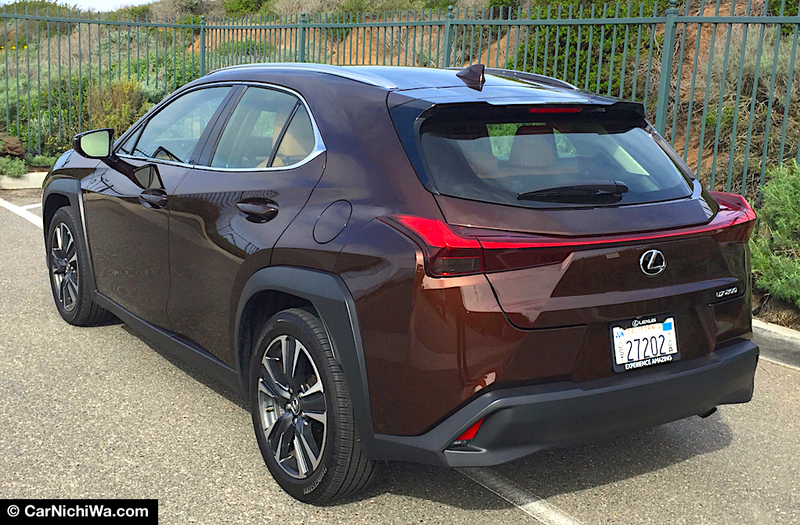 For 2019, Lexus ventures into new territory with the UX 200 compact crossover. Smaller than the RX and NX, the new UX targets younger buyers, first-time luxury brand shoppers, and empty nesters. The UX combines a compelling design with a choice of gas or hybrid powertrains, an engaging driving experience, imaginative technology, plus abundant high-tech and safety features. 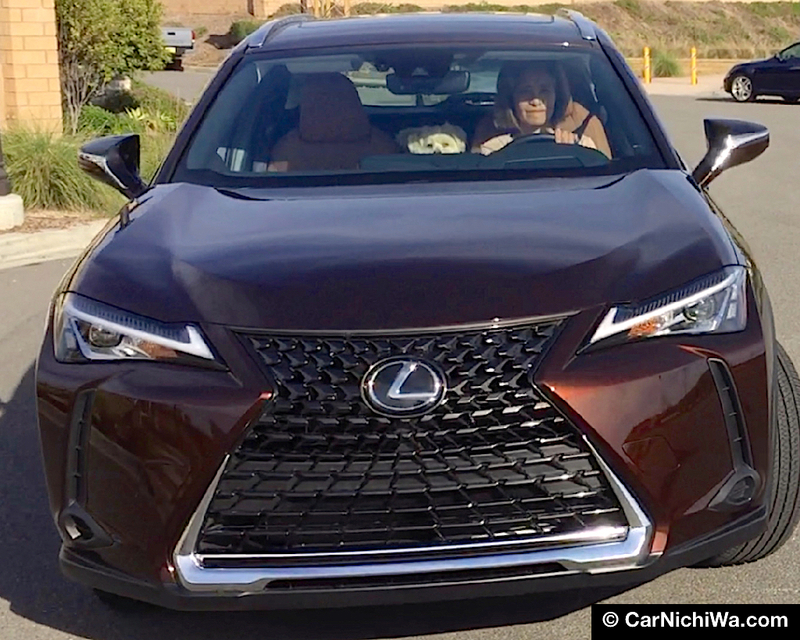 Our test-drive video (above) highlights our week behind the wheel with the new Lexus UX. We were impressed with its driving dynamics, including the ride and handling, plus the ability to tailor powertrain response with Drive Mode Select. We were lucky to schedule a weeklong test drive in the new UX 200 just as the new model went on sale. 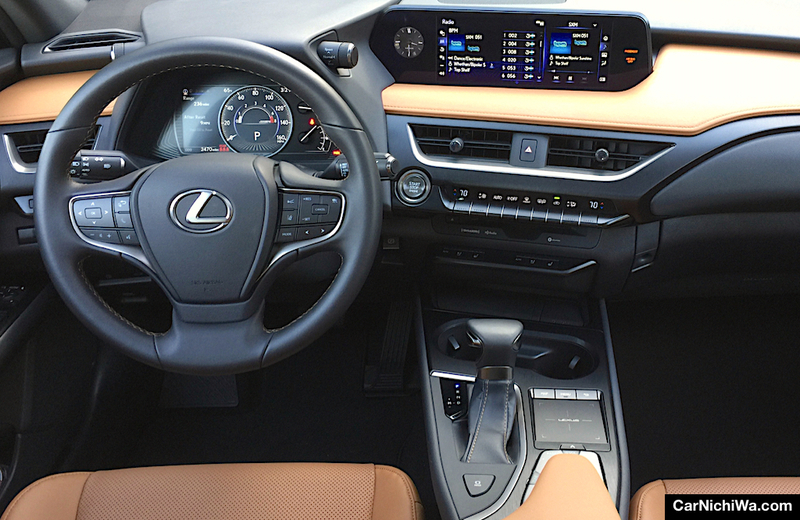 Lexus provided a pre-production prototype front-drive UX 200 equipped with the Luxury package and optional navigation system. As a brand-new vehicle the UX attracted plenty of attention wherever we went. At a shopping mall, a woman who parked next to us wanted to know everything about the new Lexus since she was in the market for a new car. Another time we stopped at a Starbucks, a guy spotted our test car, took out his smartphone, and started taking photos. We really like the styling, especially at the rear, where the UX wears a full-width “Aero Stabilizing Blade” light cluster with 120 LEDs. In addition to turning heads, the UX is designed to slip through the wind. Lexus says Takumi clay modelers worked with design and engineering to refine the exterior surfaces. Our Walkaround video (above) takes a closer look at the UX 200 exterior, interior, under the hood, and inside the luxurious cabin. We also demonstrate some key technologies including the Remote Touch Interface and voice command. With its refined front strut and multi-link rear independent suspension, the UX delivers a smooth, well-controlled ride befitting a Lexus. 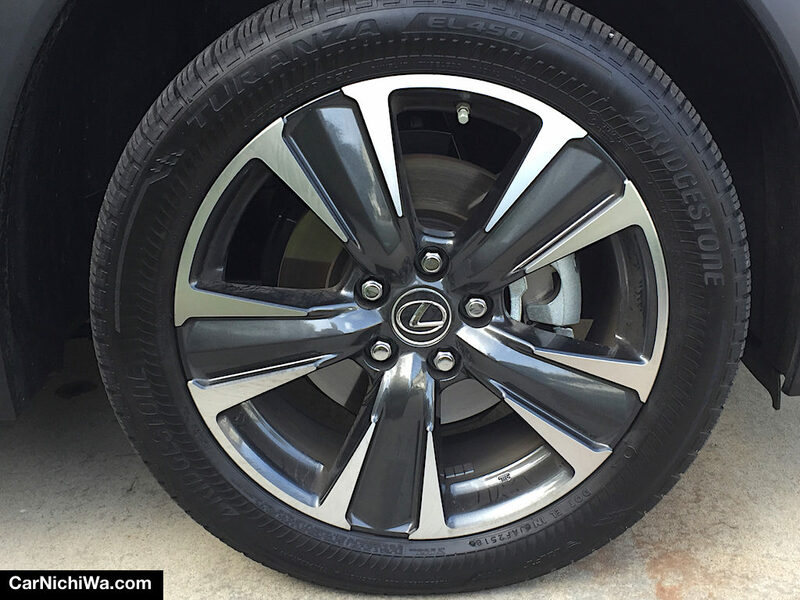 These attractive 18-inch alloy wheels with dark gray machine-finish accents are shod with 225/50RF18 all-season, second-generation, run-flat Bridgestone tires. The UX 200 is a joy to drive thanks to its responsive new 2.0-liter 4-cylinder engine. The powerplant is rated at 169 horsepower at 6,600 rpm and 151 lb.-ft. of torque at 4,800 rpm. It features D-4S direct plus port-fuel injection, laser-clad intake valve seats, high-compression ratio (13:1), and VVT-iE intelligent variable valve timing. The engine teams well with a new “10-speed” Direct Shift CVT (Continuously Variable Transmission). Lexus employs a mechanical gearset to start the UX rolling and accelerate from a stop. Once underway, the CVT with its pulley system takes over. This setup works remarkably well and also offers the choice of a manual shift gate. 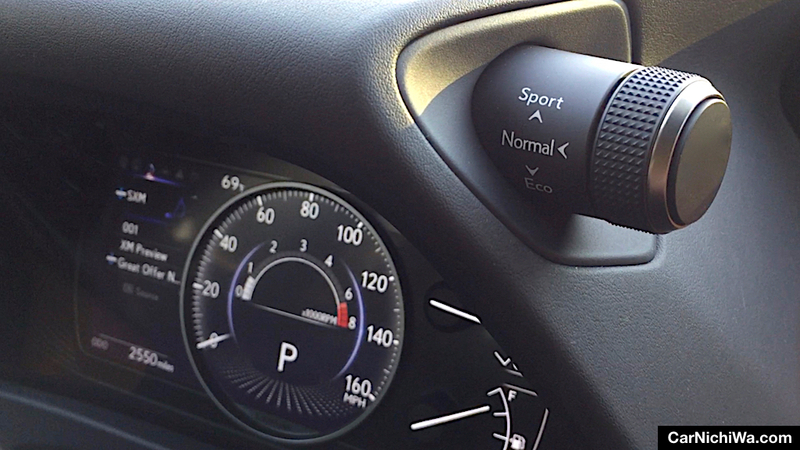 With Drive Mode Select, we could quickly switch between Normal, Eco and Sport modes using the controller mounted high on the dash behind the steering wheel. Sport delivers the quickest throttle response, while Eco helps to maximize fuel efficiency, and Normal is for everyday driving. Along with its efficient powertrain, the UX employs weight-saving materials, including aluminum doors, fenders, and hood, plus a composite tailgate. The UX 200 carries an EPA fuel economy rating of 29 city, 37 highway, and 33 combined mpg. 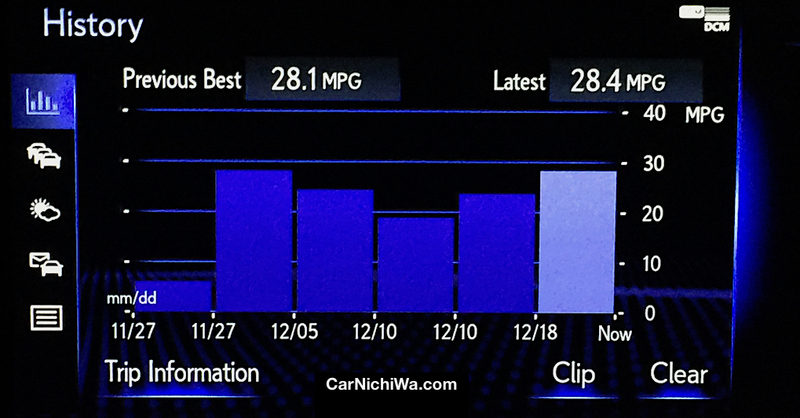 We averaged 28 mpg during our week-long test with mostly city driving (urban exploring). 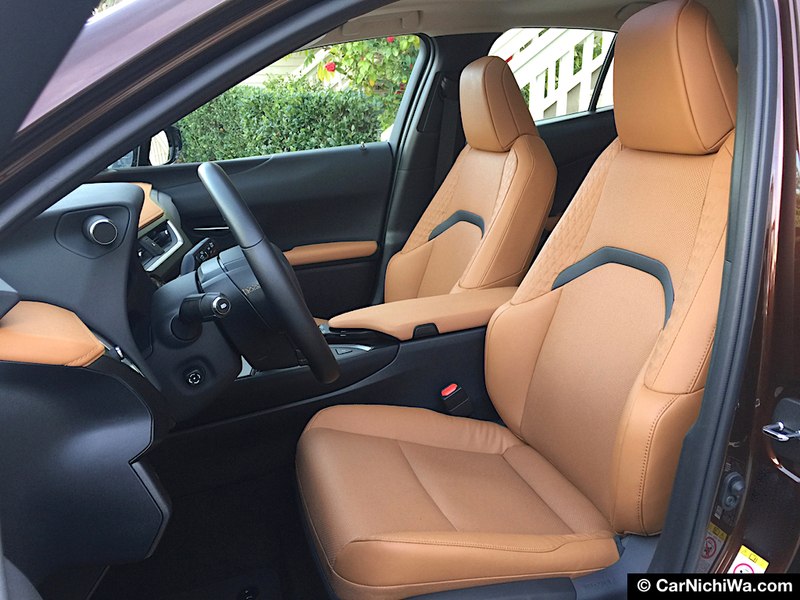 The comfortable heated and ventilated front seats on our tester are trimmed with NuLuxe in a color called Glazed Caramel. 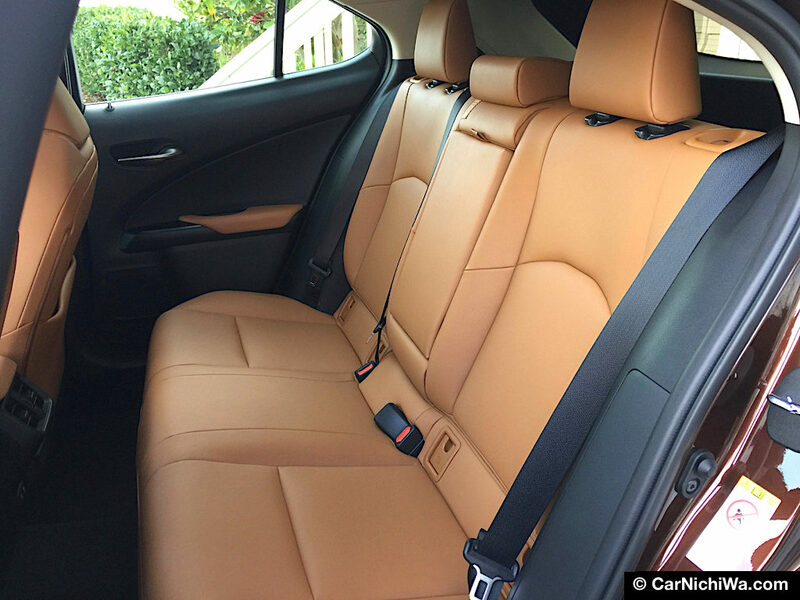 Lexus says the front seat cushions use springs and foam specially designed to gently envelop occupants while uniformly dispersing pressure under the occupants’ sciatic area. The three-passenger rear seat has a 60/40-split-folding backrest that makes it easy to carry longer objects inside the car. We should also mention that with the windows up, the cabin is extremely quiet thanks to the extensive use of sound-absorbing and insulating materials. 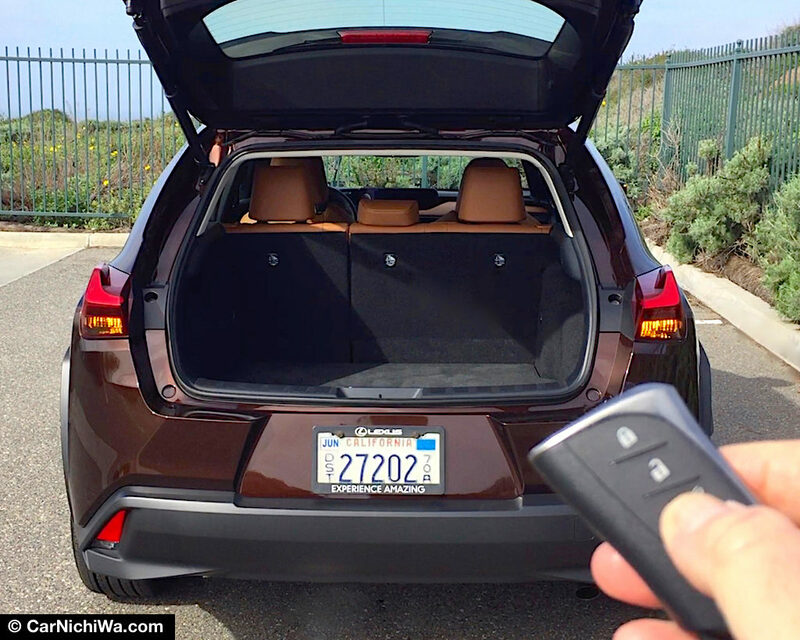 Access to the cargo compartment is easy thanks to the power tailgate. We can open it by pressing a button on the fob, or using the foot-activated, hands-free feature that’s included with the Luxury Package. 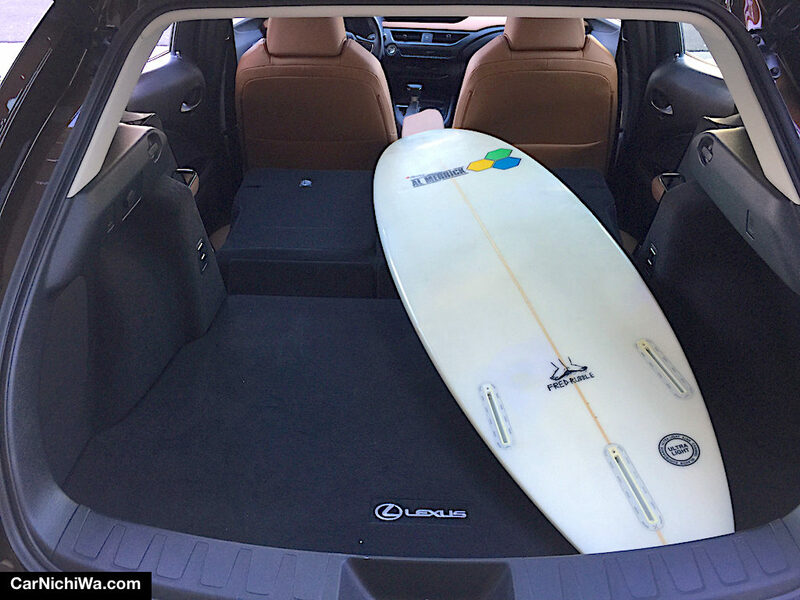 With both sides of the rear seat folded down, we were able to load our contributing editor’s surfboard inside the car and shut the tailgate. That’s a pretty amazing job of packaging considering the compact exterior dimensions of the UX. 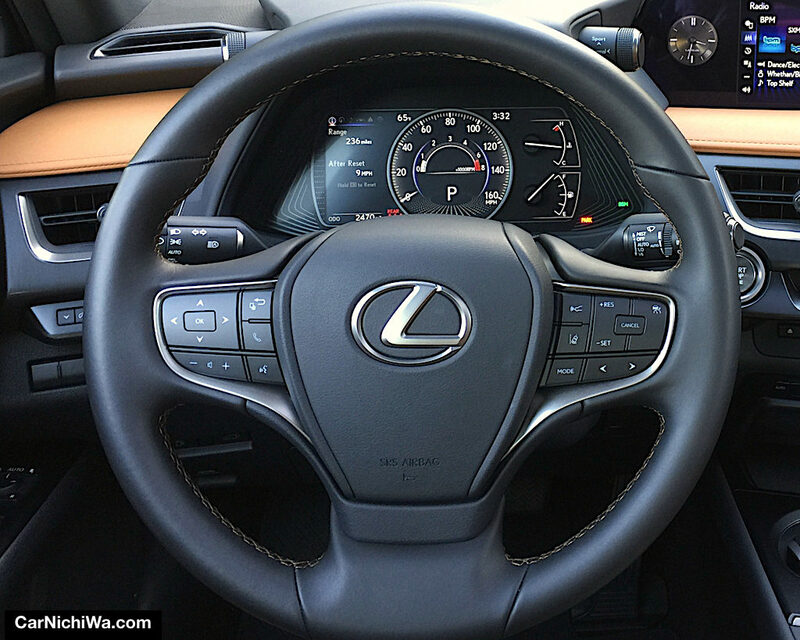 Talk about amazing, we discovered that the leather-trimmed three-spoke steering wheel, as well as the analog clock on the dash, are shared with the Lexus LS premium luxury sedan. We also like the easy to read 7-inch TFT LCD digital instrument cluster on our tester. By pressing buttons on the steering wheel, we can access a wealth of data on the Multi Information Display, and even customize the operation of some features. Meter cluster colors also change when we select different drive modes (Eco mode is shown above). 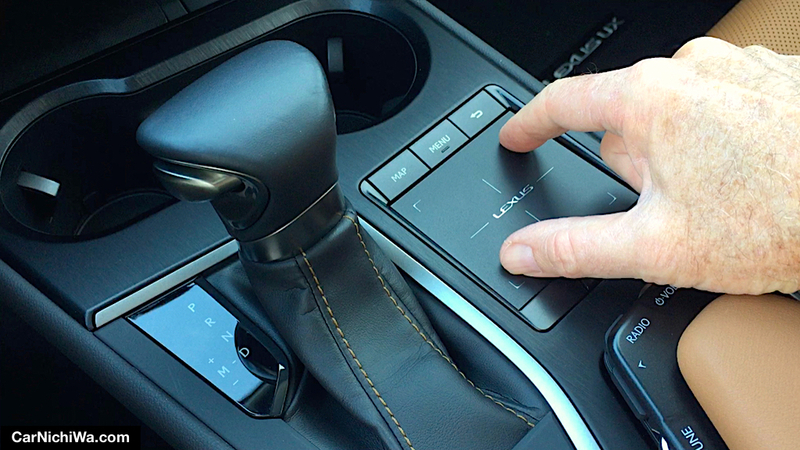 With the Lexus Remote Touch Interface, we can easily adjust and operate various features on the center display screen. The touchpad can be used like a smartphone, with pinching for zooming in and out, double-tapping, and flicking. The optional navigation system on our UX 200 includes a big, bright 10.3-inch display. Using the split-screen function, we could view a navigation map on the left side of the screen and our audio selection for SiriusXM™ Satellite Radio on the right. An easy way to access information and get directions is to use the voice command button on the steering wheel. For example, after pressing the button and hearing a prompt, we said, “Find Golf Course,” and then selected the place we wanted to go from the list (above). The system plotted our course and provided turn-by-turn directions on-screen and by voice. The UX is loaded with other connectivity features including Apple CarPlay™, Amazon Alexa, App Suite 2.0, Service Connect, and WiFi-powered by Verizon that can connect up to five devices (and provides up to 4GB of complimentary data for one year). In the safety department, our UX 200 included the standard Lexus Safety System+ with Pre-Collision System, Pedestrian Detection-Daytime and Low Light, Daytime Bicyclist Detection, Dynamic Radar Cruise Control, Road Sign Assist, Lane Tracing Assist, Automatic High Beams, Lane Departure Alert with Steering Assist, a backup camera with dynamic gridlines, and 10 years of Safety Connect. 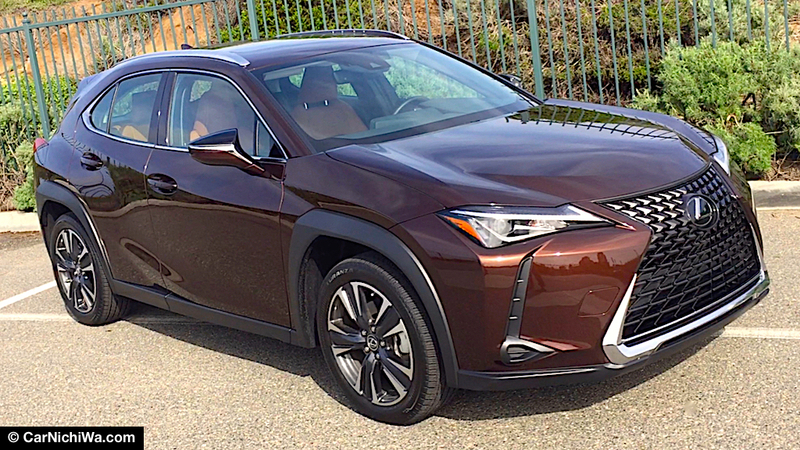 For 2019 the Lexus UX 200 has a base MSRP of $32,000. Our UX 200 with the Luxury Package listed for $37,200, while adding the navigation system brought the bottom line to $39,400. 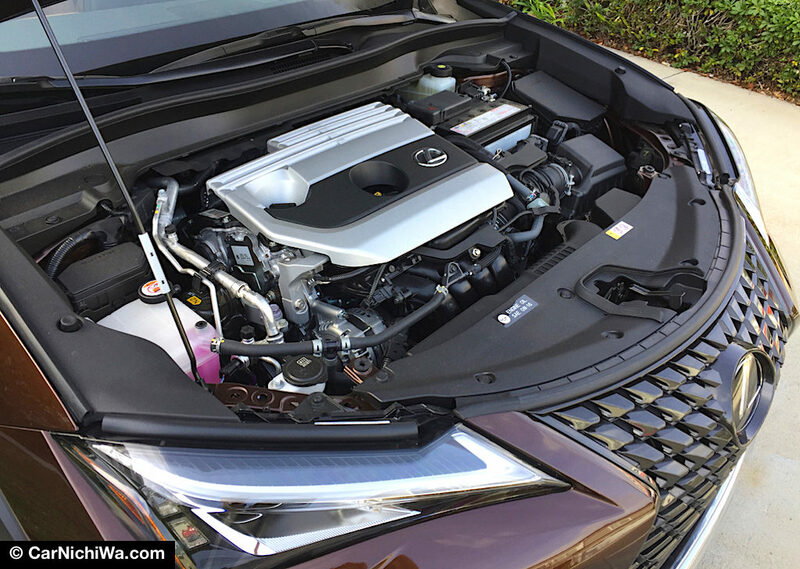 Lexus also offers the UX 250h Hybrid model that includes a gas-electric hybrid powertrain plus all-wheel drive. F Sport models, with additional performance and exclusive interior features, are also available for both gas and hybrid models. So how did we like the UX 200? We loved it! And if we were in the market for a compact crossover from a luxury brand, we’d put the new UX 200 at the top of our shopping list. UX 200 pre-production prototype press fleet vehicle provided by the Lexus Division of Toyota Motor Sales, U.S.A., Inc. Prices and vehicle information applies to U.S. production models at the time of publication, not including destination, taxes, license, etc. All product information, including prices, features and specifications is subject to change without notice.